Cardinal James Gibbons first wielded the trowel in 1888 to lay the cornerstone of Mercy Hospital in Baltimore. Cardinal Lawrence Shehan used it again in 1963 when the current Mercy Medical Center tower was built. 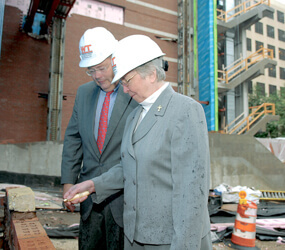 Now Mercy president/CEO Tom Mullen has joined Mercy Sister Helen Amos, executive chair of the Mercy Board of Trustees, to dust off the tool once again to mark a historic milestone. The Bunting Center will be an 18-story, 688,000 square foot hospital facility located in the 300 block of St. Paul Place, adjacent to Mercy’s current campus.